and then God SENDS us out into the world! As God GATHERS us, we respond by confessing our sins and giving thanks for our baptisms. We sing songs of worship and praise. We welcome one another in the name of God. As God meets us in the WORD, we share four pieces of scripture: an Old Testament reading, a psalm, a New Testament reading, and a Gospel reading. The pastor preaches a sermon on one or more of these Bible readings, and the congregation shares the Word of God in song. We profess our faith, share Christ’s peace, and offer prayer for the sake of the world. As God meets us in the MEAL, we share the presence of Christ in, with, and under the bread and the wine. As God SENDS us into the world, we go out blessed to be a blessing to others, and to share the gospel good news! OK, sure, but what’s it like to BE THERE? Our congregation dresses in everything from dresses to blue jeans. While the service has a structure, the feel is very friendly and relaxed. Some of the songs are familiar old hymns, others are new favorites. We have an organ, piano, and choir that help guide our singing and offer special music. 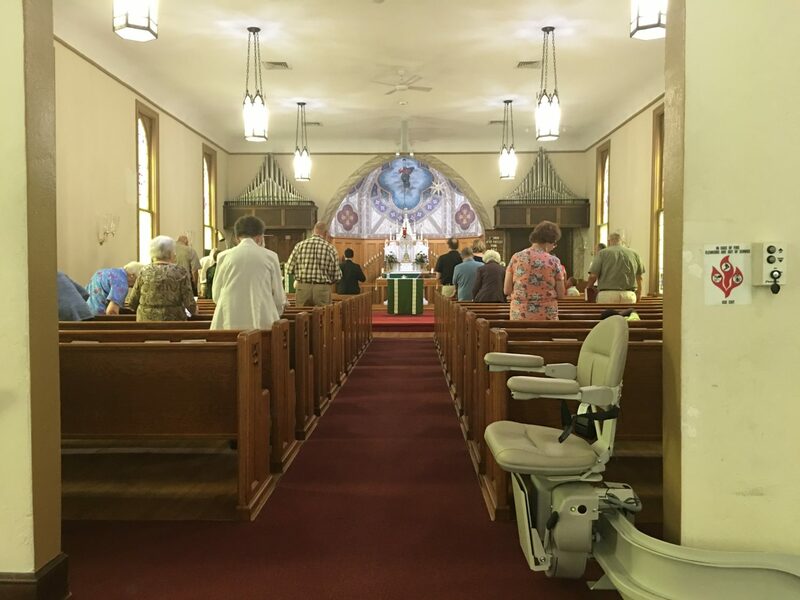 When you visit us, you can expect to be warmly greeted; that people will shake your hand and want to talk to you; that our prayer is that you’ll encounter God in this place. Do you offer childcare during church? -You can come at 10:00 and join us for a 20-minute Sunday School on the second floor of the social hall. -You can pick up a children’s bag on the way into the sanctuary. It’s full of goodies to help your child engage with the readings for the day. -You can encourage your child to come forward for the children’s sermon. -After the children’s sermon, you can choose to have your child remain with us in worship (they are always welcome! ), or you can let them go with one of our church leaders, who takes them to the same room where we have Sunday School. There are crafts, games, books, and videos there. The children come back to the sanctuary in time for communion, and stay with us for the remainder of the service. Yes; for both adults and children. Adults meet at 9:00am for the Wired Word; we talk about current events in light of different scripture readings. You can start attending at any time throughout the year. Children and parents meet at 10:00am for a 20-minute Sunday School designed to teach the stories of the Bible in a way that makes them come alive. Do you offer Bible Study? Aside from the Wired Word (see above), we have a lay-led group that meets at 9:30 on Monday mornings. They’re currently working through the book of Acts. What if I’m not Lutheran? That’s OK! A lot of us weren’t Lutheran when we started attending Trinity either. Some of us still aren’t. Having that diversity enriches our community, and we’d love to have you as you are. The fancy answer: Lutherans belong to one of the denominations that uses the Book of Concord as its foundational document. The Book of Concord is a collection of documents dating from the time of a 16th century German theologian named Martin Luther, whose writings about God’s grace (and lots of other things) revolutionized the Christian religion in late medieval Europe and jump-started the Protestant Reformation. 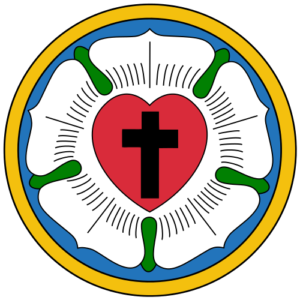 There are lots of “mottoes” that try to summarize Lutheran faith, and perhaps the central one is: “Saved by grace alone, through faith alone, in Christ alone.” We believe that nothing we do earns us our salvation: it is a free gift from God, and its truest revelation is in the life, death, and resurrection of Jesus Christ. The simple answer: We’re a flavor of Christianity, and our truest and proudest identity is that we all belong to Christ’s one church. There are several Lutheran denominations in America and throughout the world. We belong to the Evangelical Lutheran Church in America. If you are baptized, you are welcome to receive communion at our church. We believe that Christ is truly present in, with, and under the bread and the wine. If you aren’t baptized, or aren’t sure, then you are welcome to come forward for a blessing from the pastor. Just let her know when you get to the front. At communion, we offer bread, wine, and grape juice. If you are gluten-intolerant, please know that we believe that Christ is fully present in both the bread and the wine; in receiving even one, you’ve received the fullness of Christ’s presence. We would be delighted to talk about that with you! Contact Office either in person, or by phone (717-939-4998) or email ( trinitysteelton@yahoo.com).